Everyone is waiting. And no one likes to wait. So why is that? What is it about waiting that frustrates and angers us? If impatience is contrary to God’s way, what exactly is behind or underneath this sin? As I was getting dressed at the gym this morning I turned off a podcast just to think about waiting. Since God has deemed it GOOD that Mike and I wait for something about which we petition God every day, we have grown VERY aware of all the people we know who join us in looking for God to act. Alone (it was EARLY) in the women’s locker room, I reflected on what I’ve been telling God in my prayers. How we NEEDED more information so we can make plans. But is that really so? What do plans (especially when we don’t have enough info) do for us? Isn’t it that ‘making plans’ give us a sense of control so we won’t HAVE to worry? My thoughts then turned to this question as I was putting on my shoes: will there ever be a time when we DON’T worry? Right away, I pictured myself in Heaven with the Father, Jesus, and the Spirit. THERE, for sure, I wouldn’t feel this impatient anxiety. Why is that, I asked myself? Because I’d see God face to face. It’d be easier to trust Him, seeing Him, I reasoned. I would KNOW that all is taken care of. Why would being present with God in the restored world be different than now? Don’t I have His presence, His Spirit IN me? and His promises to me? For sure, I do! Yet I pushed myself to answer this question. Then I saw the unpleasant truth: I would KNOW beyond any doubt that He would provide for me. I would trust Him more than I trust Him here and now. Shame flooded me. I don’t really trust God. 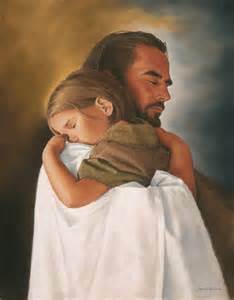 After all He has done for me in my flesh-and-blood, day-to-day life. After all the ways His Word reassures me. After all the stories of how He has come through for others. After the fact that Jesus did everything necessary for me to be united with Him, forever, in the Father’s presence of Love, in the forever restored world. So maybe, just maybe, this long wait to hear about a job is exactly what God has prescribed to PROVE to Mike and to me that He really is trustworthy. As a French teacher, I understand about individualized, differentiated instruction. Could it be that all of us are students in God’s Classroom of Patience, each of us with tailored-made homework assignments and the occasional pop-quiz? May we learn our lessons well and NOT have to repeat this class! So many friends waiting, waiting, waiting. In addition to my friend D, several other friends pray for, search and await jobs. And then there is J who holds on for a solution to a leak in her roof. It’s not like she and her husband have oodles of money in savings, available to try first one remedy or another. That’s part of the problem. The house has turned into a money pit, drawing from their retirement funds. They believe they should sell it to protect their savings. But they can’t list the house until the leak is repaired. Biding their time, they communicate, encourage and remind contractors, hopeful that each successive remedy will be THE one. My other friend has endured countless medical procedures and tests and been the subject of panels of medical boards convening to seek the best way forward for an aggressive cancer. Chosen routes have revealed dead ends. Patience, while suffering, is her familiar journey partner. Just as we have been given physical muscles to exercise in daily life, so too have Christians been given the spiritual muscle of faith. But the gift of believing God comes with a concomitant responsibility. We have to use faith, to move out, do what is good in the moment, depending on the invisible but real promises that God will come through just as His word says. We have to exercise or actively depend on God’s written pledge to provide, protect, guide, comfort us. How do we do that? By deciding to ‘believe (sight unseen) every word that proceeds from the mouth of God’ (Matt 4:4). And that FEELS costly and painful at times. Who doesn’t suffer the pains of temptation to despair over circumstances that seem to be perpetual? Yet God commands us to not look at the way things appear, but to see through the circumstances to the God who promises good to those who believe Him and cling to the truth of His promises. The other night as we were discussing the day’s Bible readings, Mike and I pondered the the connection between trusting…..believing…..expecting…..waiting ….hoping…exercising patience…… All these actions sparkle as many sides of the one diamond called FAITH in God. But what do those actions LOOK like? How do you DO expecting, waiting, hoping….? An insight has recently enriched my mind, an answer to a dilemma. I’ve often struggled to grasp how to live out Jesus’ command, in a self-deflecting, God-glorifying way: “…. let your light shine before others, so that they may see your good works and give glory to your Father who is in heaven.” Matt 5:16 I’ve gotten hung up on the concept, ‘your light’. How can I have any light in myself? The answer: this ‘light’ is the gift God has given me to BELIEVE Him. My responsibility is to show the world in a visible way (light) how much I treasure this invisible but precious reality of relying on and belonging to Jesus. God calls that way ‘patience’ or ‘trust in God’. Patience is a virtue recognized in the western world. Yet most joke about it and cavalierly let themselves off the hook by admitting they have little. When I feel strong, I affirm this fact: God is kind to give me multiple occasions to practice and improve this muscle of contented waiting on Him. Yet, I seem often to succumb to despair, sometimes multiple times in a week. But what other choice do you and I have? We can either face the sufferings in life kicking and screaming, or we can submit to the wise and loving hand of the potter who keeps us on His wheel and won’t stop until we are beautifully fashioned into the family likeness. Doubtless you have heard versions of that adage. As true as it is, the one who utters it seems to do so with a tone of frustration and resignation as though having to wait were a curse. A quote by William Gurnall, 17th century English pastor, recently arrested my attention and transformed my view of the fruit of patience. Here’s the context for Gurnall’s teaching on the value of patience: What are we to think when God is silent after we pray earnestly an ‘acceptable’ prayer? This pastor labored to persuade readers (or listeners to his sermons) to appreciate God’s delay in answering our prayers. Reading that quote the other day flipped my heart 180 degrees. All of a sudden I saw this onerous, groan-worthy quality trait as a priceless treasure God desires and wills to give us. But not as in, cut open my heart and pour in high-octane patience. Were it that easy! for a publisher finally to say YES! Considering the payoff for this kind of inner strength, I now see the KINDNESS of God in giving us multiple opportunities to practice the skill of waiting on Him. For what else are delays but God’s sovereign schedule of life’s events? And what else is Biblical faith, but a treasuring of all that God is for us and all He promises to be in the future? Doesn’t that kind of faith require PATIENCE since we don’t physically SEE what is promised? And if reflecting on some of these pledges of future blessing were not enough to help one see the payoff for patience, God brought to mind James’ motto for the ‘Saints Club’. Consider it PURE JOY my brothers when you face trials of various kinds…. (James 1: 2-4). Why? because, as this apostle explains, trials grow patient, cheerful endurance in us. The Greek term for that character quality is hypomone. Literally it means to STAY UNDER. I take that counsel to instruct me NOT to fight the trying circumstance but to practice patient waiting, praying for God to resolve it or for it to resolve itself or for my God-dependent efforts to have their effect. Whatever the outward action, the inner state of a follower of Christ is calm, patient, cheerful trust in God who ordained this particular trial and circumstance. What is ‘driving you nuts’ that God is allowing or bringing back time and time again in different forms to GIFT you with patience? ‘Unused grace is like a fragrance capped in a bottle‘, so I read the other day in one of Charles Spurgeon’s devotions. Thinking about grace prompted me actually to list in my mind the 9 fruits of the Spirit, such as kindness, patience and self-control. Those examples of God’s grace then reminded me of the qualities Paul exhorts the Colossian Church ‘to put on’ daily, such as compassion and humility. Then God stopped me cold in my thoughts. When do we act kind? or exercise patience? or control our emotions or show love? Only in those situations that TRY our patience, with those people who are difficult to love, and when our feelings lure us to vaunt or to fall into self-pity. Do I know what I’m asking God to do when I pray for Him to grow in me these qualities fitting for a child of God? What do you brag about? Some women my age trot out pictures of their grandkids or others of their prized pooches. Then there are those who boast about the good deals they secured on Black Friday or their completion of a holiday decorating schema for home and yard. But Paul exhorts us to boast in our weaknesses. I’d like to offer a case for broadening the term ‘weakness’ to mean any limitation or need that one cannot personally overcome or fulfill. Part of maturity is a coming to terms with the fact that, EVEN THOUGH THIS IS AMERICA, one CANNOT do anything one sets his or her mind to. Adult to skinny child: What are you going to be when you grow up, little boy? Child: I’m going to be an NFL linebacker! Dishonest Adult: Good for you, little boy! You can achieve anything you set your mind to. So how does getting real with our limitations apply to us, no matter our age? And can that little boy truly grow up to be an NFL linebacker? My husband and I have longings and unmet desires that we admit to one another once in a while. They tend to be activities or situations we think would meet some deep needs of personal fulfillment. One of those longings popped up last night. Mike was playing some hauntingly beautiful, classical choral music as part of his Christmas play list. When Emma Kirkby, the British soprano, began her ‘Who may abide the day of His coming?’ solo, tears from that deep place in Mike’s soul welled up. He has sung that exact piece (it’s also written for baritone) with some fine choral groups. God has given him both a voice for and love of good music. But by our moving to Western North Carolina to a gorgeous spot in the Smoky Mountains in the ‘boonies’ we have cut ourselves off from that kind of music, both by geography and our choice to join a Bible-teaching church. The conversation then turned to a time we had lived in England for 18 months. During the one Christmas season we celebrated, we had season tickets to a series of classical concerts in one of the Oxford college chapels. The acoustics of that ancient holy space and the men and boys’ choir were ethereal and soul-satisfying. That remembrance of time past led me to think of the few times, now so long ago, when we lived in Europe. And my yearnings for another occasion such as those, to plug into the life and community of a different culture and (if in France or Germany) to speak the local language flooded my heart. Both intense feelings of longing are real AND they do not mean we are unhappy living here. The desires are part of who God made us. Mike is gifted musically and I’m gifted with a curiosity for different people and love of languages. Yet….in our present circumstances, I don’t see how either can or could be fulfilled. Returning to my initial question about what you boast in, I started by proposing that these ‘current limitations’ or ‘needs’ are included in Paul’s description of ‘weaknesses’. Could it be that God actually BLOCKS our way to fulfilling some of these desires ourselves? Might He also use these unmet needs to teach us to be dependent on Him? And what about God employing them…. ….also as a means for pointing the cynically jaded, bored, and despairing world to marvel at such a God as ours who does “…EXCEEDINGLY ABUNDANTLY more than we can ask or imagine.” Ephesians 3:20? I do believe God will satisfy those yearnings or He will replace them with something better. Our challenge as God’s children is to show the world who our God is and why He is enough. It is by our BOASTING in our inability to meet our own needs along with our reliance on the God who CAN be enough when we are weak and insufficient, that we show the unbelieving world the one and only path to abundant life. Be assured, the Christian is no fool. He trusts in the God who promises that ‘in His presence is fullness of joy and pleasures evermore’. Are you willing to be the arena for the tired world to see how wonder-filled our God is? 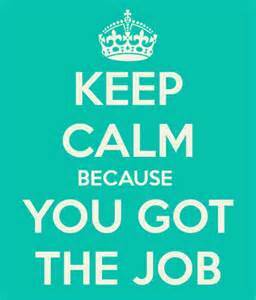 The perfect job – it exists! 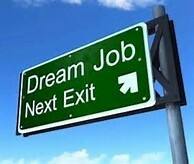 I don’t know what you fantasize about, but sometimes I imagine the feeling of just having landed THE ultimate job. In my daydream, I can FEEL the excitement, the open-ended sense of possibility, the overwhelming gratitude and joy of actually being able both to be challenged in a healthy way AND to get to do every day what makes me happiest. (Speaking French is the number one component) Included in my daydream is the notion of having been PICKED or selected with all sorts of concomitant and guaranteed learning opportunities and training that will enrich my life. I’ll be among happy fellow enthusiasts and what we do will make a difference. Maybe pipe dreams of the ideal job aren’t the ingredients that fuel your fantasy. Maybe it’s that longing for the ultimate family or skill experience/achievement (winning an Olympic gold in your event) or a different pinnacle of your own choosing. But for me, it’s always been a longing for THAT job. And as I approach 60, I’m beginning to realize, not with too many regrets, that there are milestones and goals that I probably won’t realize while I’m alive in this body. Far be THAT, however, to lead to depression. For as a Christian, the Bible teaches that the BEST is yet to come! In fact, if you think about it, since we are immortal and will be given new bodies at Jesus’ 2nd coming, bodies with more and better capacities, the idea of longing for the perfect job while here on earth is both short-sided and bound to disappoint. But if we view our time on earth as training for the future, (the internship I wrote about earlier – Last week’s blog on a Theology of Work), then we can wait patiently, knowing that God doesn’t waste ANY of our experiences. We will do work that is meaningful and satisfying. So until then, I pray and trust God for patience and gratitude for both my future destination and the preparation He gives me each day in the meantime. PS: I think the inheritance will be the invitation to come take an active productive role with the Triune God in the Kingdom! What’s the rush? You’re not going to miss your ultimate appointment! 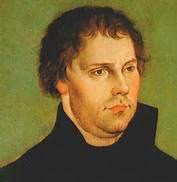 I like Martin Luther’s earthiness for he was not afraid to enjoy life boldly and speak the truth with fresh vigor. But what arrested me recently was his peculiar time-management system, at least as far as I can surmise from how he kept his calendar! What about you and me? For all the tech devices we employ, meant to make life easier, we seem to be burdened and tied down to what was designed to free us. I’ve pondered schedules and the existence of RUSHING as a lifestyle this summer. With 6 of my 9 weeks off as a teacher now a pleasant memory, I’ve been thinking a lot about TIME as I have crossed off summer chores and tackled ‘meaty’ books. Can you believe that a couple of days I even ‘stressed’ at all I had to/wanted to do? But how are we to gain this patience? Do you know ANYONE who is naturally patient? I don’t! Here’s the truth: Patience is a gift from God. But He doesn’t just imbue us with this attribute; He cultivates it IN us by means of the trials, struggles and problems He walks us through. Do you get that? Suffering has a purpose when we consecrate it to God, when we trust our good Father in the midst of our hardships. And knowing that there are reasons, even if we can’t see them, is far better than thinking that this painful stuff is just randomly occurring to us! Chalking problems up to bad luck or fate produces NO endurance or patience – for what’s the point of bearing up well, if there’s NO POINT at all! So what about those days when we don’t get done what we had planned? The good news is – it doesn’t matter! God IS sovereign over our time because it’s not OUR time, but His! He can chop it short or stretch it out. And if the only day that really counts is when we meet Him face to face, then why stress? Here’s a fact, both for the pagan unbeliever who is hostile to God AND for the child of the King who loves God. There IS a day appointed and fixed for each of us. That is Martin Luther’s red-letter day. You can be sure that you won’t miss that rendez-vous when each of us will meet Jesus face to face. You can’t rush that meeting nor delay it.